Book, book, book….. | Damian Trasler's Secret Blog - Do Not Read! So, only….er….five months after the initial idea, and I now have a published e-book to add to my credits. Actually, that’s not strictly true, as this is a document in pdf format, rather than an actual e-book, but you get the point. Back in January, as I may have mentioned, I went along to a Writer’s symposium, hosted by the Travel Writer’s Association of Canada (TWAC. I was there as part of PWAC. Acronyms are silly things.) One of the speakers talked about the need to build up your webpresence and your own brand for your writing, which lead me to rediscover this blog, for one thing, and to begin writing the book. She’d said that everyone is an expert in something, expert enough to write a book. And while your book might not be compelling enough to attract a major publisher in the paper and ink industry, the glory of the internet is that you can publish without the stunning overheads and publicise your product yourself. I realised that for over a decade I have been writing plays for the amateur stage – what the North Americans seem to call “Community Theatre” which sounds less patronising – and therefore I could legitimately say something about doing that. Plus, of course, I’ve spent the last few years as a script reader for Lazy Bee Scripts, reviewing new plays and handing out advice and judgements and assembling my own set of “What everybody gets wrong, or right” rules. The speaker at the symposium made a lot of sense, saying that the book itself is not the major feature, but you can build on the sale of the book with lectures and classes. I didn’t want to get too overexcited about that, and decided to see if I could write a convincing book first. It’s taken longer than I thought, thanks mainly to the hard work of my friends and co-writers, ensuring I didn’t settle for the first draft, going that extra mile to produce a document that’s not only worth reading but enjoyable to look at. I’m painfully aware of the number of projects that languish at the “half-completed” stage, not because I’ve run out of enthusiasm for them, but because I’m scared I’ll wreck what I’ve got by pushing on. Two plays are stuck in that limbo right now. I was determined that the book would not go the same way, and this week the final draft (number three, I think…certainly the third version to make it to the pdf stage, anyway) has arrived and been hosted, both on the Lazy Bee Website (www.lazybeescripts.co.uk ) and on the TLC website (www.tlc-creative.co.uk) . We’re advertising the book on various websites, pushing out news of it through Facebook, and later this week I’ll be attending another PWAC event where I’ll finally get to tell the other members that I have acheived something they can actually see. So, what’s the book about? It’s NOT a “How To” guide. I don’t lay out the best way to write your epic play, there aren’t any simple five-step programmes included that take you from your idea through to staging your masterwork. 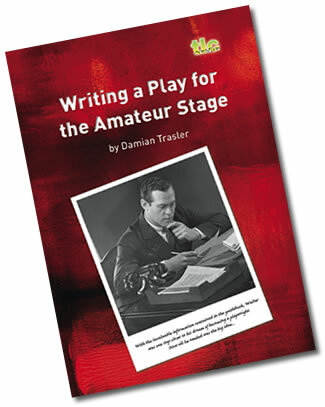 The book talks about the aspects of community theatre that make it ideal for first-time playwrights, the things that you should be aware of before you begin writing. It discusses the limitations of the local stages, and how you can get around them or work with them. It talks about the different types of writing you can do for the stage, it highlights common mistakes and other issues to avoid. Best of all, it has funny pictures with hilarious captions scattered throughout. I’ve read it about half a dozen times now, and each time I feel it’s necessary to point out that I only supplied some of the words. The organisation, proofreading, graphical work, factchecking (and occasional buttkicking) have been done by my writing partners Steve and David at TLC and by Stuart at Lazy Bee. I hope other writers will find it useful. I really hope some people who might not have considered play writing will give it a go as a result, because I hadn’t thought of plays until I was asked to write one, and they really have changed my life for the better. And if anyone’s interested, I am available for lecture tours….. This entry was posted in Uncategorized and tagged amateur stage, book, Community Theatre, ebook, Lazy Bee Scripts, Play writing, PWAC, stage, TLC, TWAC, writer, writing, writing a play for the amateur stage. Bookmark the permalink.